Please note that all courses are now closed until Spring. We have semi-permanent String, Easy, Medium, Medium+ and Long Courses. The long courses goes from the forest onto the moorland. For the summer we also have mountain bike O. Maps available from the Laggan Wolftrax Cafe, which is open daily 10am-5pm. These courses will be out until September 15th then we will put out new ones. If you need maps for a group please contact us in advance using the details at the bottom of the page. Please note that the Long Course is now closed. Use your smartphone to time yourself on our courses. see how you did against everyone else who's tried the course. map, scan the QR code below to load the course and away you go! Maps are available in the cafe for £3. 1. Download the iOrienteering app. 2. Scan the QR code below to load the course. 3. Take your map with you and find the start. 4. Zap the START control to start the timer. 5. Follow the course on the map, scanning each control along the way. 6. Scan FINISH to stop the timer. For adventurous toddlers to 8 year olds - find the woodland creatures on the Wee Beasties course, and win a prize. 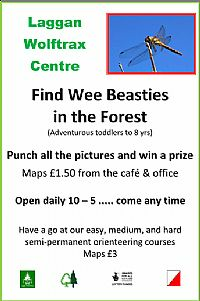 Maps £1.50 from the Laggan Wolftrax Cafe or the office in the Laggan Wolftrax Centre. Every day from 10:00 am to 5:00 pm. Three new semi-permanent courses have just been put out at Easy, Medium and Hard levels. They are all based within the forest near Wolftrax. From June we are hoping to have a Hard course which goes out onto the moorland. The Easy course is great for beginners - no previous experience is required. Orienteering on the moorland is closed just now so we just have a Short Hard course in the woodland. The string course has been taken in for the winter. A new course for young children will be available in the spring. New Medium and Hard courses are currently being planned - so watch this space for details of when they are ready. Come and buy your map at the Laggan Forest Office - the office or bike hire staff will be able to help you. All orienteering maps cost £2. 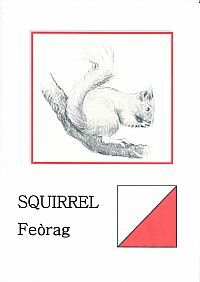 String course - available over the holidays so young children can enjoy finding the woodland creatures. Maps are available from the office free of charge. The course is to the right of the Wolftrax car park as you drive in. All Abilities Trail - orienteering for all, whether you have limited mobility or are out with a buggy. This course stays on the (fairly flat) trail. Easy course - on trails in the forest, though in several places you step off the trail for a short distance to check you have the correct control. Hard course (both technically and physically) - in forest and moorland. It can be taken as one course of about 5km or you can make shorter loops. The courses will remain the same until August 8th 2014 when new courses will be put out, and new maps available. Please note that from August 8th orienteers must not use the moorland due to shooting on the estate. There will not be any controls on the moorland and orienteers should stay in the forest. The launch of our new semi-permanent orienteering course, complete with BBQ, takes place on Tuesday June 24th at the Laggan Wolftrax car park. 1½ miles west of Laggan Bridge off the A86. If you would like to have a go, come along from 6.00 pm to register, and participate in a course to suit your experience from 6.30-7.30 pm. Or just come and enjoy the BBQ from 6.30. Help will be available for those new to orienteering and all ages and abilities are welcome. You can try one course at the side of the All Abilities Trail so no need to walk on rough ground. There is no charge for the BBQ but donations to Laggan Forest Trust will be appreciated. Meat and vegetarian options available. Our commitment to our sponsors is to encourage more people of all ages and abilities to enjoy the outdoors. So do come along and bring your friends and family. Awards for All and the Cairngorm National Park Authority have kindly provided funding for Laggan Forest Trust to develop a semi-permanent orienteering course in the forest at Strathashie and on Ben Alder land. The first stage is for the area to be remapped and then we will order equipment and plan the first course. Two Teaching Orienteering evening courses are being planned, to give people the skills to help beginners get started. No prior knowledge of orienteering is required. The course is sponsored, so is unlikely to cost more than £10. We are planning a launch event and BBQ, with the Badenoch and Strathspey Orienteering Club (BASOC). Over the summer we will be offering help to visitors who want to have a go but have never orienteered before. Your details will be stored in accordance to our privacy notice until you choose to opt-out.